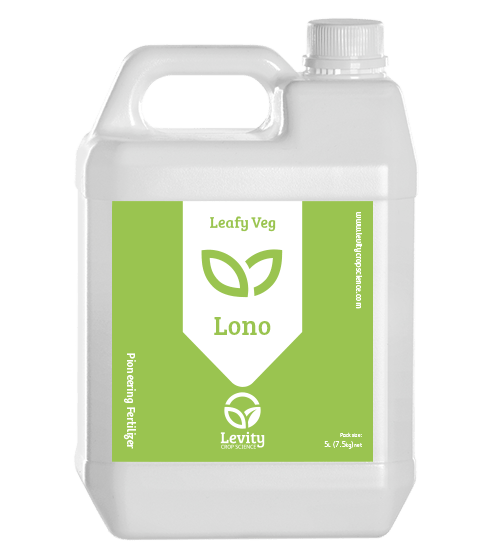 Lono for Leafy Veg is a smart fertiliser that focuses the plant on reproductive growth. Lono uses Levity’s LimiN chemistry to hold nitrogen in the amine form and also contains calcium, which gives a more robust growth habit with a better root system, lower leaf nitrates, and a boxy compact shape with higher weight and dry matter content. Lono helps crops maintain growth during periods of stress, safeguarding yield. Key benefits: Fast establishment, reduced transplant stress, Increased weight, more even size distribution, improved grading, better growth during stress. Application Rate: General application rate 5 l/ha through drip irrigation or as foliar spray, at 14 day intervals. Transplanting 2 l/ha at transplanting in transplant water to improve establishment and reduce stress.